The 1996 live-action remake is a little more complicated. It's difficult to say for certain, but the timing of the movie seems to be slightly offset. The scene before the dogs are kidnapped has "The Christmas Song" in the background while the puppies are being given collars. It's not 100% explicit, but I'd interpret this as meaning the scene and abduction occur on Christmas Day. The live-action movie has some additional holiday credentials, though. The movie is written by John Hughes, who basically treats it as another Home Alone sequel. Let's set the holidays aside for a moment and talk about the movies. They're difficult to compare, due to the fact one is a work of stunning beauty, while the other is unworthy of being compared to anything passing through the rear ends of any of its stars. I sincerely hope you don't need me to say which is which. The original animated film is brilliantly understated, cleverly satirical, and above all else, charming. The movie's stars are the two dalmatian parents. They refer to humans as their pets, and are portrayed as more intelligent and perceptive. This is actually a subtle inversion of a formula Disney animation used, where a secondary animal-centered plot line would support its human characters. Here, the human characters are comic relief, while the animals take the starring adventure roles. 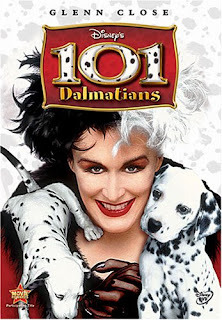 The live-action remake plays down the animal characters considerably. In their place, the focal point of the movie is... er... actually, I think they forgot to include one. This is a movie that doesn't really have an A-plot. For better or worse, the animals no longer speak. Unfortunately, I can't say the same for Jeff Daniels, who is cast as the caring, British owner of one of the dogs. 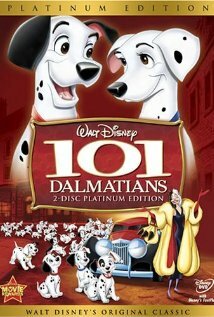 The story of the animated version follows Pongo and Perdita, the two dalmatian parents, as they undergo a long, difficult journey to take back their children. The quest is portrayed as physically painful and exhausting: it takes a toll onthem, but their drive to reclaim their family is far stronger. They get help from numerous dogs and other animals on the way. The danger feels real. When the dogs confront the men who took their children, they're portrayed almost demonically. You almost feel for the criminals as the dogs tear into them. The live-action, in contrast, is timid and childish. The journey is basically portrayed as a side note, and the fights are replaced with Home Alone-style antics. The showdown at the hall is dropped entirely: another dog rescues the puppies, and the only potentially brutal exchange is off camera. The animated movie stood against cruelty to animals and the fur industry. I'm not really sure what the live-action was about, but maybe we can figure it out. The movie's villain was a successful, single career woman who was adamantly opposed to her female employee getting married and leaving the workforce. When her best employee got married, she became obsessed with killing her dogs and wearing them as a fur coat. The former employee's new husband designed video games and managed to create a hit by basing the villain on the aforementioned successful businesswoman. So... I guess the remake was about ethics in video game journalism? At any rate, the remake is awful. The movie has no driving plot or theme beyond literally demonizing its only remaining strong female character (since they cut Perdita's role to next-to-nothing). It threw out everything about the original beyond the superficial, then reformed that into an animal-heavy version of Home Alone. More than that, it dishonors the memory of the original, which is a spectacular film that deserves to finally be recognized as the holiday classic it's secretly always been. With that in mind, I'm declaring the 1961 animated film highly recommended, and it's poorly conceived remake a crime against humanity. For the love of Sirius, Lord of the Dog Star, don't get the two confused.